Amy Wilde is just a normal girl from Yorkshire. She works as a garden designer in London and likes to get her hands dirty, so she doesn't really fit into the posh crowd of people that surround her glamorous flatmate Jo. Despite that the two are best friends and Jo still tries to occasionally set Amy up with one of her well-off male acquaintances. But Amy is determined to find a normal man to share her life with and she thinks she's found a likely candidate when she meets the gorgeous Leo as he and his friend Rolf show up to a party uninvited. When Rolf barges in and almost ruins the night with his antics, Leo is there to pick up the pieces before he disappears in a trail of mystery. Despite their very brief encounter, he instantly wins over Amy with his charm and good looks. That is, until Jo breaks the news that Leo is not only very posh and very rich, but he is also a prince. What follows is the often hilarious and sometimes moving story of Amy coming to terms with the fact that her prince charming is a genuine prince and is bound by all the responsibilities that come with the role. Amy's private life is soon scrutinised by the press as she's swept up by Leo in a whirlwind of charity events, expensive jewels and private jet trips. And let's not forget the nerve-wrecking meetings with the in-laws; Prince Boris of Nirona and Svetland and his wife, stunning supermodel Liza Bachmann. As Amy is catapulted into the glittering and awe-inspiring surroundings of royalty the reader gets a glimpse into this otherwise foreign world. I loved reading about Amy's adventures, particularly after she finds out about Leo's true identity. Despite having lived under the radar for most of her life she suddenly finds herself a celebrity as people talk about her on the royalty blogs. It's certainly not all fun and games, which is particularly noticeable in Amy's case as she's a very down to earth girl and it is hard for her to adjust to all the changes in her life. Lacking any royalty knowledge whatsoever and terrified of making a faux pass, Amy often finds herself in mortifying situations which from a reader's perspective are very funny. They transform what could've been a dull read, droning on about etiquette and customs, into something much more light-hearted and entertaining. Special mention also to the beautiful cover of the novel, which not only is very girly - covered in roses no doubt because these flowers play a central part within the book - but it also has a vintage feel to it, which adds to the enchantment of the story. 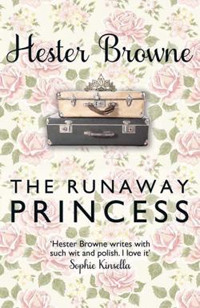 The Runaway Princess is very much an adult version of The Princess Diaries; a sweet modern-day fairytale filled with a lot of hilarious escapades and a lot of heart. I'm loving the sound of that book so will pick it up next time I'm out! I am an avid book reader, so enjoyed browsing through your blog!